Freedom’s laceration should have healed more . . . it’s in a bad place. Hard to keep clean, hard to keep him still. It was one of those weeks where I felt like I spoke to my vet more than my friends! I like my vet, but mostly I want to see her twice a year for shots. I’ve now seen her three times in the past month, so I’m hoping that my spell of bad luck is over. 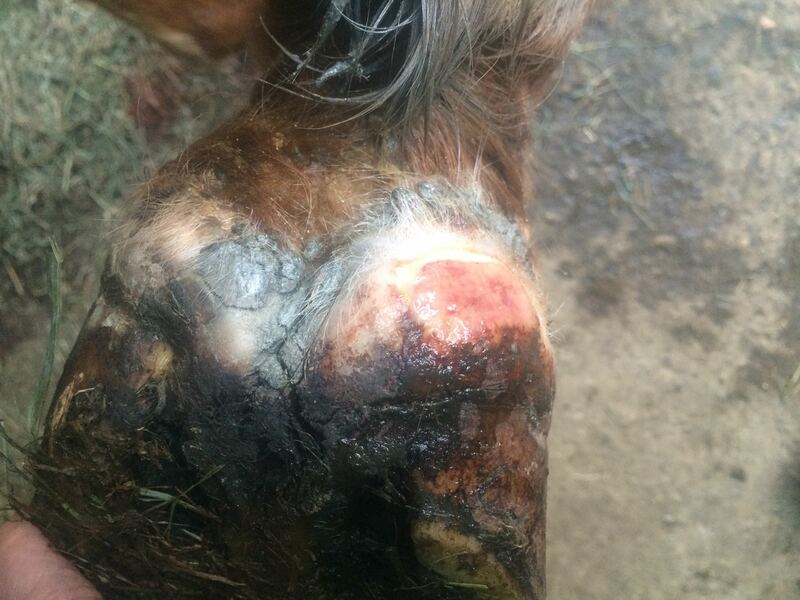 Freedom’s heel bulb laceration isn’t healing well. It’s in a prime location to develop proud flesh and to promote healing, she needed to cut away the excessive granulation tissue. It was not fun. Even with his foot blocked, the only way to keep him still was with a lip chain. When it was done, it looked like a small animal had died in the aisle — there was a lot of blood. To add insult to injury, he’s also developed scratches on that foot. I guess the good news is that he’s sound on the foot and not particularly bothered by it. Still, it’s going to take a long time to heal. I am armed with saline wash, a treatment for the granulation tissue and enough sterile pads and bandages to treat an army. That was Thursday. Fast forward to yesterday morning. When I went to feed in the morning, he was clearly not himself. He refused to eat. He was lethargic. he was yawning excessively and rocking his lower jaw. He was colicky. Thank goodness we keep Banamine on hand at the barn. I dosed him in the morning and at my vet’s advice, also syringed a cup of Milk of Magnesia down his throat. Two hours later he was looking brighter and moving around. He’d passed manure and was looking hungry — and mad that he was not allowed food until the evening. Banamine is really a wonderful drug. By dinner time, he was back to his normal self and guarding his food from Willow. He got another dose of Banamine as a preventative, but if you hadn’t seen him in the morning, you wouldn’t know he’d been feeling so sick. At 10 p.m. he was still chowing down on his hay (provided in a small hole net to make it last longer). Of course this happened during our first real snowstorm of the year when the roads were nasty and most everything was closed. That’s a rule, isn’t it? They are really such fragile creatures. What kills me is that I almost put hoof boots on him that morning because the ground was so hard. I came back 4 hours later to this! oh no! that foot looks super ouchy… glad he recovered from his distress of the morning tho! good luck getting him through the recovery!